Devprayag is well known for origin of the Holiest River Ganga. Ganga is a holiest river in the Hindu religion and it said that taking a holy dip in River Ganga wash all the sins of people. The Meaning of Devprayag is Dev means God and Prayag means confluence so we can say it in the Hindi Devthirath. Devprayag is the confluence of rivers Bhagirathi and Alaknanda. You can also see the amazing view of two different colors of both rivers in Devprayag confluence. Devprayag is situated in the Tehri Garhwal District and some part of Devprayag is also comes in Pauri Garhwal district of Uttarakhand state. It is located at the elevation of 618mts above from the sea level. 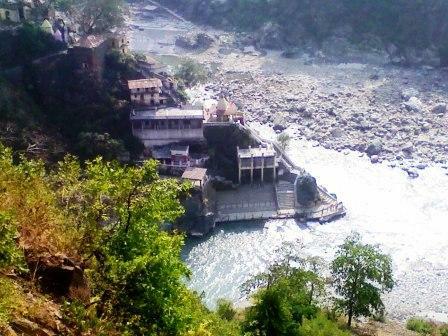 Devprayag is lies between the Rishikesh and Badrinath Highway roads. Distance from Rishikesh is 70kms. The town devprayag holds great religious importance in Hindu religion. According to legends, Lord Rama and his father Great King Dusratha did penance here, the main temple of Devprayag is “Raghunath Ji temple” dedicated to Lord Rama. It is also winter home of the Badrinath Pandavas. The bathing Ghats at Devprayag is built with multiple level to accommodate different river water levels during the season of monsoon. You can also see the15 foot tall ancient temple of Shri Raghunath Ji. Devprayag is always special pilgrimage center and you can visit here any time of the year. By Roads: - Devprayag is well connected through the roads transport from other cities. By Trains: - The Neatest railway station in Rishikesh, the distance from devprayag is 70 kms. By Air: - The Nearest airport is jolly grant Dehradun, and the distance from Devprayag is 90km. Where to stay: - You can take here any type of hotel I mean budget and Deluxe.